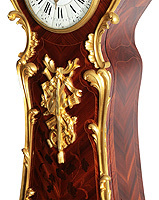 A Very Fine and Palatial French 19th Century Regence Style Figural Ormolu Mounted Kingwood and Tulipwood Floral Marquetry Long-Case Regulator, after a Model by Charles Cressent (French, 1685-1768). The circular porcelain clock face with Roman numerals and inscribed Henry Dasson, A Paris. 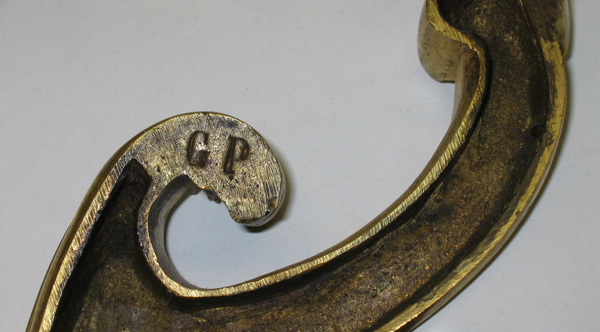 An ormolu mount stamped "GP" After the bronzier Pierre Gouthière (1740-1806). 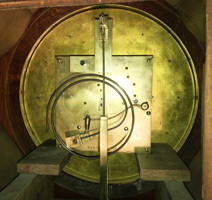 The façade with musical trophy mount and shaped lenticle, with an Apollo-mask pendulum, winding key, key to case. Circa: Paris, 1880.